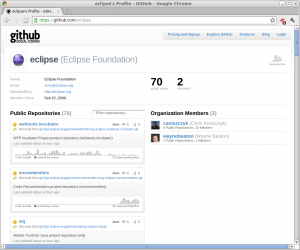 I’m happy to announce we finally setup mirroring of eclipse.org repositories on GitHub. If you need more information, please check out the wiki for more information about GitHub. I also want to thank Wayne Beaton for his portal metadata wrangling and Ketan Padegaonkar for helping out with this effort.